Well, he made it. There were times in the past when we weren’t sure what he would be like at 16, but we are very proud of the young man David has become. Despite our best efforts, David did not want a big party. In fact, he preferred to not have much of a party at all. He just wanted his pie. 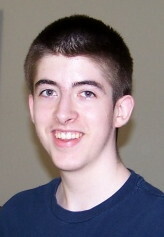 The gifts this year turned more musical as David pursues his passion for drumming and Rock Band. I have to admit (although I am biased), the kid has talent. I am blown away by his ability to pick up beats and riffs quickly and play them well. Some day he may even let us listen in while he practices! You can see more pictures from his birthday in the gallery here. Happy Birthday, Son. You are making us proud and we can’t wait to see what God has in store for you! I have been remiss in not updating you all earlier, but David has passed another milestone in his educational career. Oregon state law specifies that homeschoolers are tested by a third party after the third, fifth, eighth, and tenth grade years. David took that test last month and, once again, did quite well. You get all kinds of strange numbers to measure his scoring, but the most easily understandable is the “Grade Equivalent”. If he receives a GE of 11.3, that means he scored as well as the average student in the 3rd month of the 11th grade would have scored on the same test. 13.0 is the maximum and implies the student did as well as a college student would have on the same test. The battery of tests includes two focused on reading, two focused on language arts, and two focused on math. His GE score was 13.0 on all but one of those and the outlier was still ranked 11.4. The overall GE was 13.0. A smashing success in all respects. What makes this year even more exciting is that this is the last year David will have to take the state test. He is about to enter his junior year, so we actually have more pressing matters to plan. Up next in the coming school year will be the SAT and the ACT. The SAT didn’t scare David until I explained that he would have to arrive at the local high school at 8:00 AM on a Saturday morning to take them. That is, by far, the worst part for him. To say that we are proud of his accomplishment is an understatement. He continues to do better and better each year and we can’t wait to see how well he does on the “bigger” tests. The implications are staggering for us, though, too. The fact that he will be taking the SAT and ACT within a year only means that college is right around the corner. That’s just amazing that it has arrived so soon. Way to go, David! Keep up the great work! For those who may not know me well enough, my childhood was heavily influenced by Lego. I loved Lego sets. I craved more pieces and more variety. I was constantly building spaceships, cities, and anything else that came to mind. For a little while, I was taking pictures of them so I could rebuild them later. I never did, though, because my imagination was always urging me on. Lego were possibly the most creative outlet I had until I discovered software engineering. So, when I stumbled across this article at Gizmodo the other day, it really brought me back. I used to pore over the catalogs imagining how cool it would be to have every Lego Space set at once or what I could build with the large Technic sets they were marketing to pre-teen boys like myself. These weren’t just simple boxes full of bricks. These were tickets to ride a time portal to emotions and simpler days long forgotten. Hmm, now where is my big, denim drawstring Lego bag? Only geeks would think of a Mother’s Day this way. Since Stefanie lives with a couple of geeks, this is what she gets. Her gift was a digital photo frame loaded with a variety of photos from our life. Give it up for a geeky Mother’s Day! I finally decided that I should start contributing to the family blog site. What better time to start than Mother’s Day? As many of you know, this is my first Mother’s Day without my mom. To say that I have mixed feelings is an understatement. To know that Mom is with our Lord and Savior, that is a time of rejoicing. The hard part is being more selfish and wanting her here with me. 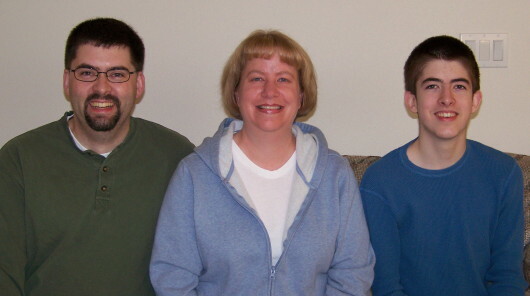 My brothers and I were blessed to have two very wonderful parents. To have a mother that was home with us when we were young, just being there when we needed her, was awesome. Did we always agree on things? That is certainly a “no”. Did we know that we loved each other? That is truly a “yes”. As the only daughter in a family of four children, I know that my relationship with Mom was different than that of my brothers. Those of you who are daughters certainly know what I am talking about. I learned many things from my mother and for that I am truly thankful. On this Mother’s Day, remember that your mom is special no matter how difficult she may be, that the Lord gifted you with this mother for a reason, and to treasure the short time that you are blessed with her. I miss you Mom and look forward to seeing you again soon. Last weekend the Portland Webbs trekked north to visit the Camano Island Webbs. The Ellensburg Webbs (Liz, Britt, and Madison along with Craig) also came west to join us. This gathering was to celebrate Dad’s 60th birthday. Gifts were exchanged. A slideshow was played. And cousins were chased. All in all a great time was had by everyone concerned. 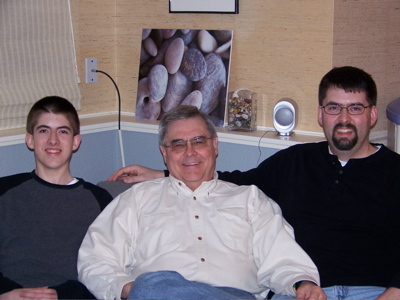 It was also a great opportunity to get the latest three generation photo. More photos are in the gallery here. I keep meaning to add an entry soon. I have some opinion items I wanted to share and it’s a good time to write since I’m home on vacation. However, we’ve all just finished getting over some lingering colds, so we’re just sort of enjoying being lazy and comfortable without coughing and Kleenex. We’re doing well. The shopping is done. We’re ready to sleep in for the next few days and just enjoy spending time together. 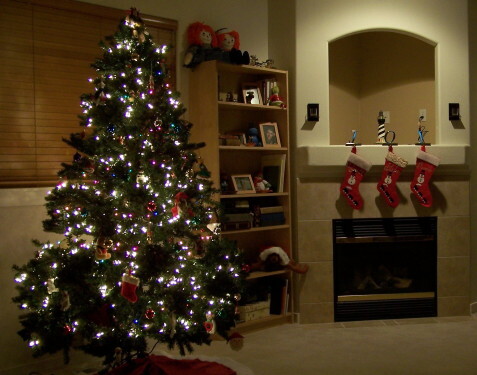 So, mostly I just want to wish you all a Merry Christmas. I hope you are somewhere as fun and relaxing as we are to celebrate our Savior’s birth! So, I have to give big kudos to David for making this event happen. During this past summer, he heard about two of his favorite bands going on tour together. Switchfoot and Relient K are rock bands known for their uplifting music with Christian overtones. When I discovered that we could get a discount on tickets if we bought in a group of 10, David was on a mission. He signed up seven other friends (Stef, David, and I made the first three) and asked me to buy the tickets. Once I did, he passed out tickets and collected the money. So, not only did he get to go, but he helped a bunch of friends get organized as well. We ended up taking David and three of his friends in our own van, but there were twenty or thirty kids from his youth group when we arrived. As you can see from the pictures I’ve posted here, we had a blast! Oh and a big thank you to Micah Holmes and Abbie Kirkpatrick for taking some of the photos I’ve posted. Well, I’ve worked in my industry long enough that I now have an enviable problem. I am blessed with more vacation than I normally take in a year, but my company also has a “use it or lose it” policy. So, November and December become months heavy with time off for me. As a result, we’ve been busy with my vacation time and that has kept me from updating the blog. Nonetheless, we are certainly enjoying ourselves! So, Happy Thanksgiving to you all from the Webbs! Today, Stefanie and her brothers fulfilled the last wish of their mother. 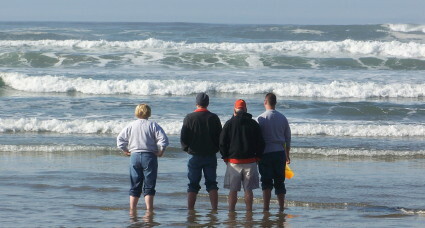 She wanted her ashes to be spread in the Pacific Ocean which we did at Arcadia Beach near Cannon Beach, Oregon. The weather was perfect and the moment was beautiful. Once again, we say farewell for now to Cari. Click the picture to see more photos taken during our trip.